« Who Looks Best in Christian Louboutin’s ‘Tuctopen’ Sandals: Jennifer Lopez or Sofia Vergara? Storm Reid joined Heidi Klum, Skai Jackson, Mariah Carey, and Marsai Martin at the 2018 Nickelodeon Kids’ Choice Awards on Saturday. She later appeared on stage with Hailee Steinfeld to present the first award of the night – Favorite TV Actress to Stranger Things‘ Millie Bobby Brown. 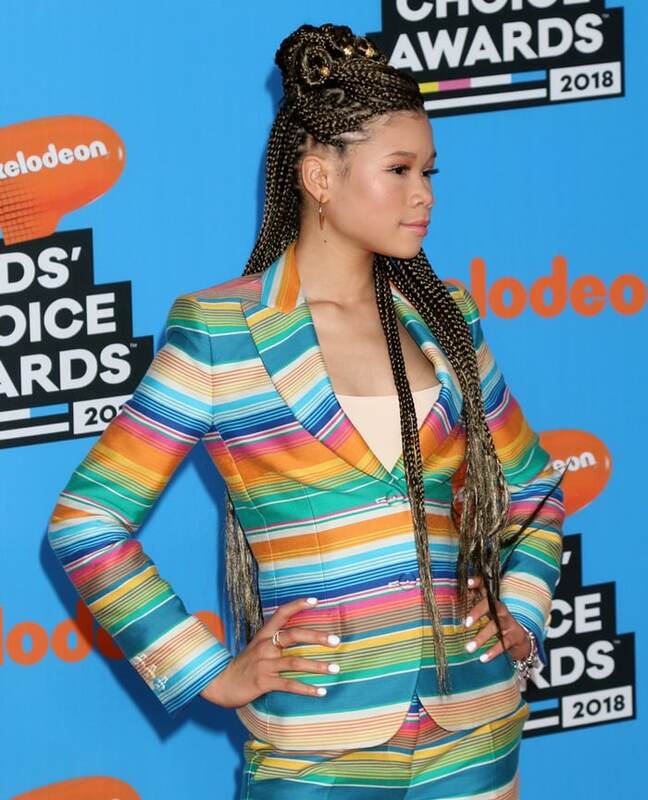 The 14-year-old ‘A Wrinkle in Time’ actress sported a multicolored cotton striped formal blazer from the Moschino Resort 2018 collection featuring classic lapels, long sleeves and a button fastening ($1,650 at Farfetch). 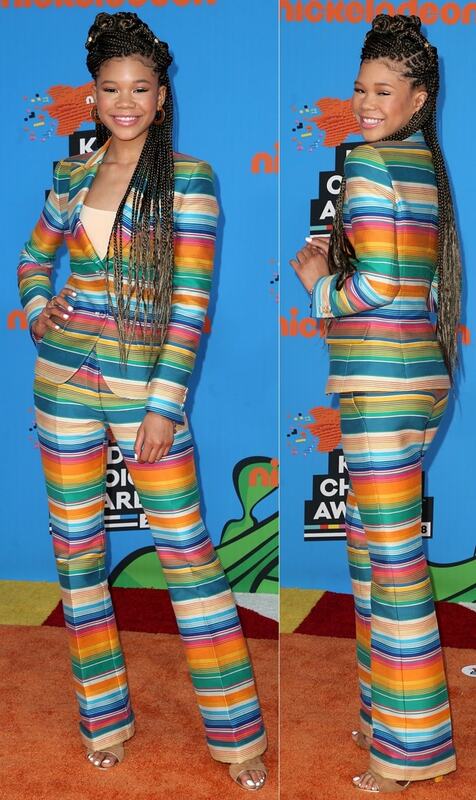 Storm styled the rainbow-striped blazer with matching pants, an Item M6 bodysuit, and ‘Careen’ color-block suede sandals from Malone Souliers ($584 at Matches Fashion). 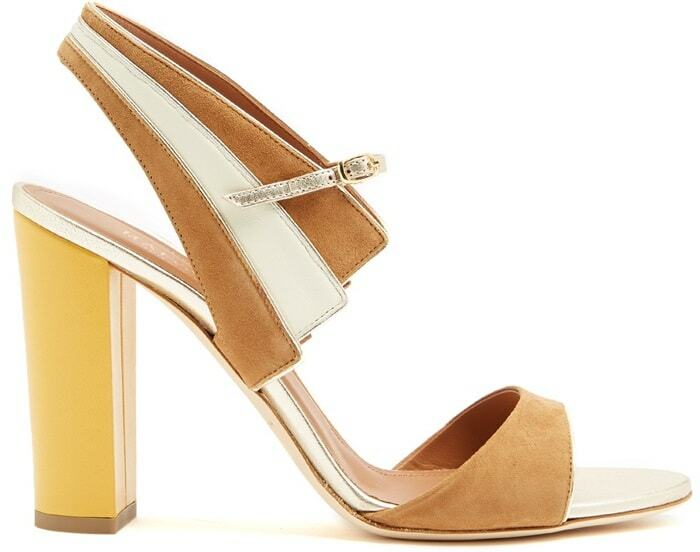 The yellow leather-covered block heel of Malone Souliers’ tan-brown sandals gives them a spring-ready slant. They’re made from suede in Italy with white and brown ankle and heel panels, gold-tone metal hardware and metallic silver piping. Earlier this month, Storm also wore a stunning pair of raspberry ankle-strap sandals to the European premiere of ‘A Wrinkle in Time’ at BFI IMAX in London, England. She styled them with a custom fuchsia satin cap sleeve Prada dress. Her outfit was styled by Jason Bolden.